Sweden is the third largest country in Western Europe and it has the largest population of the Nordic countries. Sweden is one of the world’s highest life expectancies and one of the lowest birth rates. The country of Sweden is a highly developed stable democracy with a modern economy. Sweden is a highly industrialized country and is an export oriented market economy featuring a modern distribution system, excellent internal and external communications, and a skilled labor force. 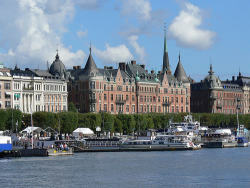 Sweden is one of the world’s most attractive countries for foreign investors. Apart from offering a favorable business climate, a strong domestic market, an advanced high-tech sector, a qualified labor force, optimal management skills, and generous “welfare-state ” benefits, it also offers the second lowest corporate tax rate in Europe. A military power during the 17th century, Sweden has not participated in any war in almost two centuries. An armed neutrality was preserved in both World Wars. Sweden’s long-successful economic formula of a capitalist system interlarded with substantial welfare elements was challenged in the 1990s by high unemployment and in 2000-02 by the global economic downturn, but fiscal discipline over the past several years has allowed the country to weather economic vagaries. Sweden joined the EU in 1995, but the public rejected the introduction of the Euro in a 2003 referendum. Aided by peace and neutrality for the whole of the 20th century, Sweden has achieved an enviable standard of living under a mixed system of high-tech capitalism and extensive welfare benefits. It has a modern distribution system, excellent internal and external communications, and a skilled labor force. Timber, hydropower, and iron ore constitute the resource base of an economy heavily oriented toward foreign trade. Privately owned firms account for about 90% of industrial output, of which the engineering sector accounts for 50% of output and exports. Agriculture accounts for only 1% of GDP and 2% of employment. The Swedish central bank focuses on price stability with its inflation target of 2%. Growth remained sluggish in 2003 but picked up during 2004-06. In September 2003, Swedish voters turned down entry into the Euro system concerned about the impact on the economy and sovereignty. Situated in Northern Europe, Sweden lies west of the Baltic Sea and Gulf of Bothnia, providing a long coastline, and forms the eastern part of the Scandinavian Peninsula. To the west is the Scandinavian mountain chain, a range that separates Sweden from Norway. Sweden has three main regions. Norrland, covering about three-fifths of the country, is mountainous and has vast forests and large ore deposits. Svealand has undulating glacial ridges and contains most of the country’s 90,000 lakes. Götaland comprises the stony Småland highlands and the rich Skåne plains. About 15% of Sweden lies north of the Arctic Circle. Southern Sweden is predominantly agricultural, with increasing forest coverage northward. The highest population density is in the Öresund region in southern Sweden, and in the valley of lake Mälaren in central Sweden. Gotland and Öland are Sweden’s largest islands; Vänern and Vättern are Sweden’s largest lakes. Sweden enjoys a mostly temperate climate despite its northern latitude, mainly because of the Gulf Stream. In the south of Sweden, leaf-bearing trees are prolific, further north pines, spruces and in the very north hardy birches dominate the landscape. In the mountains of northern Sweden a sub-Arctic climate predominates. North of the Arctic Circle, the sun never sets for part of each summer, and in the winter, night is similarly unending. Swedish authors of worldwide recognition include Henning Mankell, Carolus Linnaeus (the father of botany and modern taxonomy), Emanuel Swedenborg, August Strindberg and Astrid Lindgren, the author of the Pippi Longstocking books. Some well-known inventions and discoveries, historical and modern, were made by Swedes. Some notable figures are Alfred Nobel (inventor of dynamite) and Anders Celsius (inventor of the Celsius temperature scale). Swedish twentieth-century culture is noted by pioneering works in the early days of cinema. In the 1920s–1980s, the filmmakers Ingmar Bergman and Bo Widerberg received Academy Awards, and actresses Greta Garbo, Ingrid Bergman and Anita Ekberg made careers abroad. Sweden has a rich musical tradition, ranging from medieval folk ballads to house music. Swedish music has also influenced the European pop music scene, especially in the late 1980s and early 1990s. Sweden is mandatory for all children aged 7-16. Most 6 year olds attend a pre school class run within the school system. The school year in Sweden runs from mid/late August to early/mid June the coming year. The Christmas holiday from mid December to early January divides the Swedish school year into two terms. Förskola (literally “preschool”), colloquially daghem or dagis, is the kindergarten. Grundskola is the 1-9 grade primary school. Gymnasieskola (literally “gymnasium school”) is the three-year secondary school. Högskola (literally “high school”) is a tertiary school (formally translated to university college, less formally to university) and universitet (always translated to university) is a tertiary school with postgraduate education. Secondary school, called gymnasieskola, lasts for three years (however some students study for four or more years for various reasons) and is formally elective, although most attend it and there are very few prospects for those who do not attend. Secondary school is divided into so called “programs”, e.g. different types of choices of educational focus. The two most common “programs” are “social knowledge” (samhällskunskap) and “science” (naturvetenskap). The “programs” are further divided into orientations. There are currently 17 different national programs – centrally defined program curricula – with between two and four centrally defined orientations. In addition there are local programs and orientations, but most schools use the national programs. Completing secondary school on a vocational program with full classes on a three year curriculum does provide a basic qualification for further studies. However many times post-secondary education is required before being admitted at university or university college. Post-secondary education is provided by Municipal “KomVux” schools (short for KOMmunal VUXenutbildning, lit. “Municipal Adult Education”), and independent boarding schools named Folkhögskolor (or Folk High Schools in English). Instead of opting for higher education, a student from a vocational program in secondary school is able to apply for what is called Qualified Vocational Education or “Kvalificerad Yrkesutbildning” (KY). This form combines education and practical experience from business or industry in the chosen field. The level of education is essentially post-secondary but can also contain courses that meet the requirements of tertiary education. For post-secondary education, the KomVux and the Qualified Vocational Education in some ways correspond to what is offered by community colleges in the United States. On 1 July 2007, a new higher education system came into effect in Sweden. Higher education became divided into three levels: basic level (grundnivå), advanced level (avancerad nivå), and graduate level (forskarnivå). The new changes also included removing several professional / vocational degrees (yrkesexamina) as well as redefining other pre-existing degrees. Both degrees require completing a thesis. The Degree of Master (Two years), masterexamen, is a new degree that is intended to be closely linked to continuing education at the graduate level. Three sets of grades exist. There is one set that consists of (3, 4, 5) where 5 is the highest. This grade set is normally given in courses within technical professional degrees (these educational institutions are often referred to as högskolor in Sweden, and their curriculum is on par with a typical international university). The other grade set consist of G (pass) and VG (pass with distinction), and this grade set is typically used at educational institutions that are referred to as universitet. In this set VG is the highest. Finally there are some courses, within two systems of grading, in which you can only get G (pass) or fail. For instance in a 20 point thesis (specialized level) in Computer Science for a Master’s degree at högskolan one can only get the grade G (pass) or fail, but for an equivalent thesis at a Swedish university one can also receive the grade VG. However, there are current plans to reform the system according to the Bologna process and the European Credit Transfer and Accumulation System, to facilitate Inter-European exchange. Higher education is free of charge, both for Swedes and for foreigners. However, according to Swedish law, student union membership, which is not free, is mandatory for all university students. There is a discussion in parliament about charging foreign students (non EU-citizens) in the future. Swedish students receive economic help from the the Swedish National Board of Student Aid (CSN) for studying. Every student is entitled to 12 semesters of allowances and loans, totaling 1,841 SEK per week (July 2007: 200 EUR; 274 USD; 137 GBP) for full-time studies (after 1 July 2006). Allowances are usually 632 SEK per week (August 2007: 68 EUR; 94 USD; 46 GBP) with loans covering the rest. The limits for loans and allowances may be substantially increased under certain circumstances. Although higher education studies are free, the student loans that most students would have to take to economically sustain themselves during studies, mostly lead to post-university debts that can lie in the range of 15000 – 40000 EUR depending on where the studies have been conducted and what courses have been taken.